I got a nice note in the electronic door this week from the good folks over at 1913 Unfinished Business letting me know about a rather interesting event coming up very soon. 1913 Unfinished Business started off as a radio show on NearFM hosted by some familiar faces from DCTV's The Live Register. The series focuses on the anniversary of the 1913 Lockout, and what relevance it has to us today - really the whole "Unfinished Business" title should give you all a clue about where they're going with this. If you haven't had a chance to hear the show live, you can catch up on the first two episodes which are available as podcasts on the NearFM website. Building on the themes of the show, the producers have decided to take its message to the streets, and by "the streets" I mean "the comfortable surroundings of Wynn's Hotel", because obviously "the streets" are, like, sooooo October 2012. The aim of this event is to provide a platform for young folks abandoned by a Government who would rather see them swept under the carpet and away to Australia than to have them stick around as a constant reminder that their policies have mortgaged the lives of our future generations to pay the gambling debts of the Developer-Banking Complex, a platform that will let them stand up and say, "I'm not going. I'm going to stay here, to take a stand and make a difference". Now given that today's announcement of the rather meh Electric Picnic line-up generated more online chatter in an hour than a month's worth of Croke Park II negotiations, I might be forgiven for being slightly cynical about the eagerness of the Young Peoples of Ireland(TM) to stand up and say "No Más! ", but the 1913 Unfinished folks are determined to assist them with a platform when they do. "1913 Unfinished Business is an activist group working to reinvigorate class politics in Dublin using the centenary of the Lockout as an inspiration. 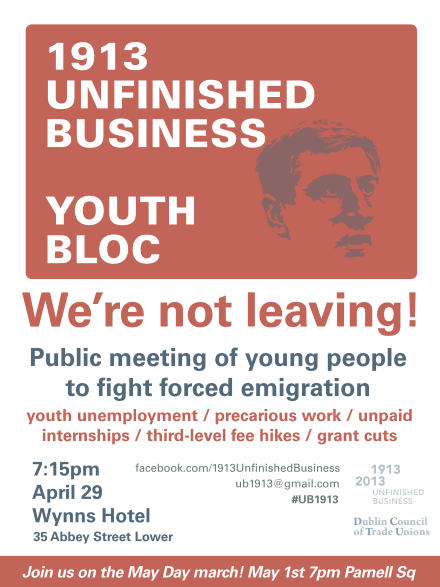 ‘We’re Not Leaving’ is a public meeting of young people to fight forced emigration. Emigration during the recession has reached famine level, with 200 people leaving the country every day. This social disaster is a direct result of the conditions facing young people in the Irish economy: youth unemployment, precarious work, unpaid internships, higher education fee hikes and grant cuts. How can young workers, students and the unemployed work in solidarity across our different struggles to tackle the challenges that unify us? How can we stay and fight? The public meeting will build towards a youth bloc on the May Day march in Dublin." Aha, marching on May Day! So apparently 'the streets" are cool again after all, like bow-ties and fezzes. Who would have guessed? Anyway, the meeting is on Monday 29th April in Wynn's Hotel on Lower Abbey Street at 7:15pm, and if you are lucky enough to still get asked for ID in the off-licence and have even the slightest concern for your future and are outraged by the unjust decisions made by an uncaring government that will affect not only you, but your children and their children (and if not, why not? ), then get your backside down there, even if only to Tweet cynically from the back that you were Not Leaving before it was cool to be Not Leaving. There's even a page on the Facebooks for it. This is a great initiative, and anything that gives young folks an opportunity to engage with substantive issues outside of the traditional and altogether rather stale and moribund party political system can only be a good thing. I'd go along myself but I'd be afraid that they would see the red light flashing in my palm and send the Sandmen after me.